While creating an operating budget may not be an organization’s overarching goal, it is an integral part of strategic planning that requires a radiology practice to look forward, see the desired results, and try to set a course to achieve them. Mapping out a strategic plan involves goal setting, a plan of action to achieve the goals, and monitoring systems to measure the efforts intended to achieve those goals. Operating budgets can tangibly show the results of numerous decisions that have been made and often act as a report card on the success of any given strategy. The intent of this article is to define and illustrate the necessary components that radiology practices must consider as they carve out a budget. In simple terms, an operating budget is a projection or a snapshot of the results a practice hopes to achieve or believes it will achieve. The words “hope” and “believe” are used here because budgeting is an intuitive process that can be employed for different purposes and executed in various ways. While hospitals tend to be steeped in the budgeting process, in many radiology practices, budgets are often wrongly considered unimportant or unnecessary. A general feeling that the clinical side of a practice lacks control over the business aspects of revenues and expenses can lead to the mindset that there is no reason to project them. Such thinking often leads to mediocrity and lost opportunities for practices. Once a group determines it will put a budget in place, the process can be based on scientific data or hopeful intuition. The most commonly applied budget process involves looking at historical data and assuming a repeat in the future. Small changes are usually made to either revenue or expense figures based on known differences. So using a historical budget method as an example, if a practice spent $50,000 in legal fees last year, the budget for next year would be $50,000 with perhaps a small inflation adjustment. This type of budget can be useful, especially in a stable revenue and expense environment, but it does little to show that the practice is operating efficiently. It merely projects future results based on past results. A much more effective budget method is called zero-based budgeting. Although zero-based budgeting is more time consuming and difficult, it produces a better model of a practice’s operations and can help identify waste or inefficiencies. With zero-based budgeting, a practice looks at each revenue and expense category individually and projects what it hopes and believes will be used over the next year. A practice may still use past performance in this process but only as one component of a more in-depth review, which should also be tied to its strategic plan. Using the legal fees example from above, instead of assuming it will spend the same as in prior years, a practice would look at its anticipated regular legal needs and then review potential outstanding issues and calculate a total projected cost based on projected rates. This process produces a budgeted expense that is more reflective of both what the practice believes it will spend and what it hopes to achieve. Whether doing a historically based budget or a zero-based budget, a practice should separate projections into three basic components: revenues, variable costs, and fixed costs. Each of these components is handled differently and, when combined, they flow into a snapshot of what the forecasted results will be. 1. Revenue: The most critical elements and usually the most difficult to project are revenues, which are the driving force of the budget and the operation. Accurately projecting revenues will be the most critical element of a budget’s value to the practice. While revenue is the linchpin to a good budget, the key is to accurately project them via the strategic planning process. Analyzing historical allocations by CPT code and payer mix for each location serviced is a good starting point. Next, an analysis of the competition changes in the market and reimbursement changes on the horizon should be considered. Looking at seasonal ups and downs and the number of working days in a given month are also notable elements. For example, practice members might ask, “When do holidays fall and how might they impact volumes?” By piecing together various factors, a practice can intuitively predict volumes and match them against local market trends and rates to project its revenues. If a practice traditionally has a Medicare volume of 30% of charges and no changes of consequence are anticipated in the market, then it can project the reimbursements for this category based on the correlative information. However, let’s say the hospital the practice provides service for is planning to install a new 64-slice CT scanner. Will the practice pick up new volumes or potentially lose them to other specialties? Looking at historical volumes may help identify past trends, but practice members must ask whether these trends will continue. There are many considerations that should go into a good zero-based revenue budget and while revenue projections may never be exact, there should be a firm idea of the trends expected. Once revenues are set, expenses should come into greater focus with variable costs being next on the list. 2. Variable costs: Variable costs, as the name implies, are subject to change based on volumes. Once revenues are projected, the anticipated volumes of procedures can be used to project variable costs associated with those procedures. For a hospital or a radiology practice with its own imaging centers, projecting variable costs is another critical exercise—and important to a hospital-only–based radiology practice. Projecting variable costs, also known as cost accounting, is the process of determining the number of units of material or labor that goes into the production of a product or service. In radiology, the cost per unit of these items is determined and then the cost per procedure is projected. Many radiology firms work with medical consulting firms and certified public accountants to look more closely at cost accounting. For example, the expenses associated with an MRI of the brain with contrast could be found by costing out the number of milliliters of contrast needed per procedure, then estimating the average time to perform the procedure and using this to assign the cost of staff. To take it a step further, the cost of utilities needed to perform the task may also be projected. Typically, the process is simplified to focus only on those costs that will not occur if the procedure is not performed, like the use of contrast in this example. While staffing and utilities may be a variable cost in the technical sense of the term, in actual operations these items are usually considered more of a fixed cost. Therefore, the goal in looking at variable costs is to determine those expenses that fluctuate up or down solely based on procedure volumes. Though a hospital-only radiology practice may not need to worry about costs such as contrast, volumes may affect physician-staffing decisions. A practice might ask whether it anticipates the need to replace a retiring partner or add a physician due to increasing volume or what impact these volumes may have on vacations or schedules. It may discover a need for locum coverage to fill some gaps, for example. All these considerations greatly depend on volumes. 3. Fixed costs: Fixed costs are expenses that occur even if there is no volume and no procedures. As discussed in No. 2 above, practices can sometimes blur the application of fixed and variable costs and, depending on the level of sophistication and detail desired, a practice often lists technically variable costs as fixed. The most common fixed costs are relatively simple to identify and include rent, lease payments on equipment, maintenance contracts, administrative salaries, and other items such as licenses and fees. The gray areas of variable and fixed costs may include part-time staffing, legal services, and office supplies. Fixed costs are usually the easiest section of the budget to project and typically are the most accurate since rent and other fixed payments do not change that often. The Budget Is in Place. Now What? Once the various budget components have been developed, leaders can use the budget to anticipate what a practice’s profitability will look like. It makes sense for practice members to confirm the results of their calculations, that estimates are reasonable, and whether the totals appear to make sense. Once a practice has what it believes and hopes to be an accurate depiction of future results, its leaders can begin measuring actual results against anticipated results. Comparing each budget category monthly and seeking explanations of variances help keep the budget on track or point out where adjustments may be needed. If revenue or expenses are dramatically different from the budget, understanding why is important. The true benefit of a budget is its ability to highlight the accuracy (or inaccuracy) of assumptions in real dollar terms and provide timely understanding about where and how those assumptions may have been right and where and how they may have been wrong. This knowledge—which develops as practices go through the budget process year after year—gives leadership an opportunity to make changes to its operation on a timely basis. In addition, by analyzing how budget aligns with the strategic bets placed during the planning process, practices will have an additional report card as to the effectiveness of those bets. While a budget does not define how effective an operation is, without one, operating results are left to chance with no real measure of success or failure. Good budgeting includes both science and intuition in making projections. Practices working with budgets control their destiny better and operate less blindly. 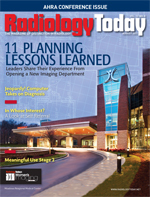 In today’s tumultuous healthcare environment, using all the tools available may be necessary to radiology business success—even if a little guessing is involved. — David A. Myrice, CPA, MBA, is a senior finance manager and practice administrator with Atlanta-based Medical Management Professionals, Inc.